So I'm just going to quietly wait over here for the cries of outrage, wailing, gnashing of teeth, and assorted brickbats. Yes it's low amount as it's just starting to break into markets. The journalist also seems too be unaware, cherry picking or totally making up his facts when saying "solar is at least twice as expensive a generator as coal and almost twice as expensive as gas". Looking at the world markets solar and onshore wind kick gas and coals arse. And the cost is falling for renewables (especially solar), unlike other fossil fuels (gas did fall a bit but as the cost of gas went up again that kills that). He has a go at batteries totally ignoring the facts that batteries are in fact to day cheaper enough to start taking a way business from gas peaker plants. He goes on about renewables not being reliable ignoring quite a number of markets that are getting large percentages of electricity from them and ignoring conventional sources can fall over quite often as well (looking at Belgium). Renewables are competitive now and are beginning to take over new installed figures for electricity. This is just another bit of FUD written by a hack to feed an audience that wants to hear this. If this is the sort of place where fans of fossil fuel like to go to for their information then I suggest you are scrapping the bottom of the barrel and will of course only get the dreg's. It's not so much "cries of outrage, wailing, gnashing of teeth, and assorted brickbats. ", it's more rolling of eyes and maybe a face palm. 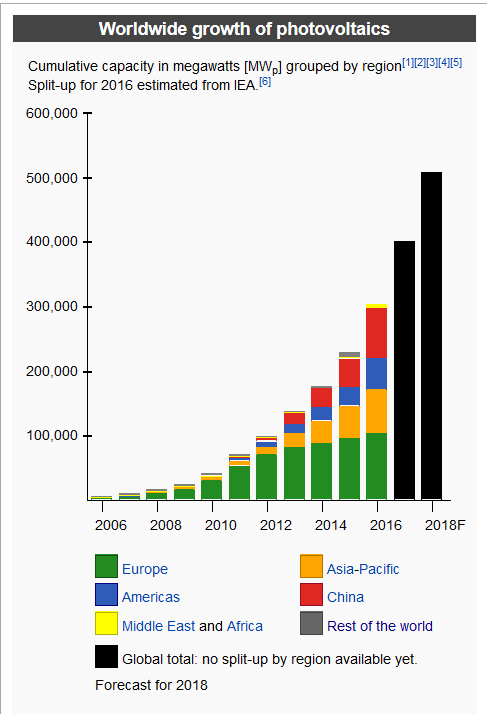 It's true that now solar and wind account only for a very small share of worldwide energy consumption but it's like like with EVs : if you just look at the current market share you can think it does not have an impact. But to get the real picture you have to consider also the exponential rate of growth. Solar cumulative capacity is doubling every 3 years. So the current market share is expected to be multiplied manyfold in the coming years. 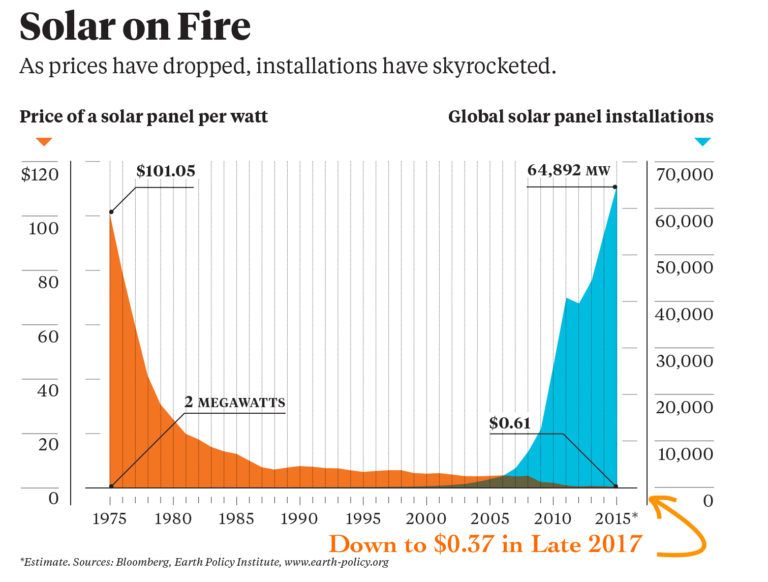 This growth is sustained by the falling price of solar energy. Wind and solar are used to produce electricity, so it's the share of wind and solar used to produce electricity that matters, not total global primal energy... There are no cars powered by solar panels (directly at least). The share of solar doubles not every three years but every two years and a few months. That pace is set to accelerate as it becomes the cheapest form of electricity generation everywhere in the world. It's little now, but it grows fast. By the very nature of exponential growth, most of the advances will be made in very few years, leaving people asking themselves how it went so fast. There are no cars powered by solar panels (directly at least). Theres even a company that is or is about to make a car with panels. It should give it on a sunny day an extra 30km. Can't remember what they are called now. Just saw it on Fullycharged tease video of their European jolly, Sono Motors. Edited November 24, 2018 by DA? All that solar and wind generates electricity. How much primary energy in the form of coal, gas or oil is needed to generate electricity. You need to apply a factor of 2-3 to the solar/wind figure to give a fair comparison. Somebody really doesn't like the Oil Price forum, but still takes the time to register and complain repeatedly about this forum and about me. You have no idea how amusing I find your red downvotes and bluster. Normally I would edit this post of yours but since Tom so graciously replied to your post I shall leave it. If you have different viewpoints feel free to share them here. If you have nothing to add other than personally disparaging comments to community members, you must find another community in which to do so. I'm wondering if there is any value to placing solar panels on the roofs of people's homes and businesses ,opposed,to solar farms taking up valuable land for agriculture....anything to do with subsidies and tax money paying for solar farms and then charging us again for the energy, or am I just being naive, stupid and conspiratorial.......surely not ! While there is a lot Tom and I disagree on he is open to considering alternative views. Roof spaces are the best place because they serve no other function. A better system would be to support domestic solar and enable more direct use. A Uk company producers a diverter that uses surplus electricity to heat water rather than export the power. Even better if that power is used to drive a heat pump. Roof spaces are great for domestic and some businesses. But depending where you live, many people live in apartments or large industries needing vast amounts of power, so land is used. In many places subsidises are given to encourage the use of renewables but now renewables are competitive with other energy sources this will change. Although one industries subsidy is another industries tax break or even just ignored. Having the panels lower to the ground is also cheaper and allows for easier cleaning. Occasionally agricultural land is used but this is normally low grade stuff that's not really missed. There is some experimentation in places like Japan placing the panels at height so crops can grow underneath, this can even increase yields. I've recently installed 6.6KW solar panels on my roof (despite shading by gorgeous gumtree) - price after subsidies (>100% of my cost) become irresistible and there was a hope for payback in ~2-3 years time while increasing value of property. Agree on hot water; good way to store ~free energy. 1. It is - anthropogenic CO2 is responsible for for approximately 65% of the increased radiative forcing in the atmosphere. 2. Locality affects that but the EROEI for both solar and wind is pretty good and you need to consider they both produce electricity which has the highest fungibility of all energy sources compared to input energy which is predominantly primary energy. This study (http://www.inderscience.com/offer.php?id=62496) of contemporary wind turbines came back with a EROEI of 40 which is the high end but an overall EROEI for the whole industry of 18-20 would be reasonable. Solar is lower (probably around 10-15) but it is effectively without limitation when it comes to scale. That low EROEI is partly due to the fact that much of the installation to date has been in wealthy countries that don't necessarily have the best solar resources (Germany being a good example). Were all that PV to be redeployed to desert regions the EROEI ratio would increase by 40-60%. 3. So can electricity with increasing range as batteries and motor efficiency improve. One advantage to onsite is you can get out of the large installation somewhere. Wind farms for example, require a huge infrastructure to deliver the electricity. So does just about every other utility scale power producer. Distributed power has it's challenges, but as technologies evolves, the mega project producer will become a stranded asset, IMHO. 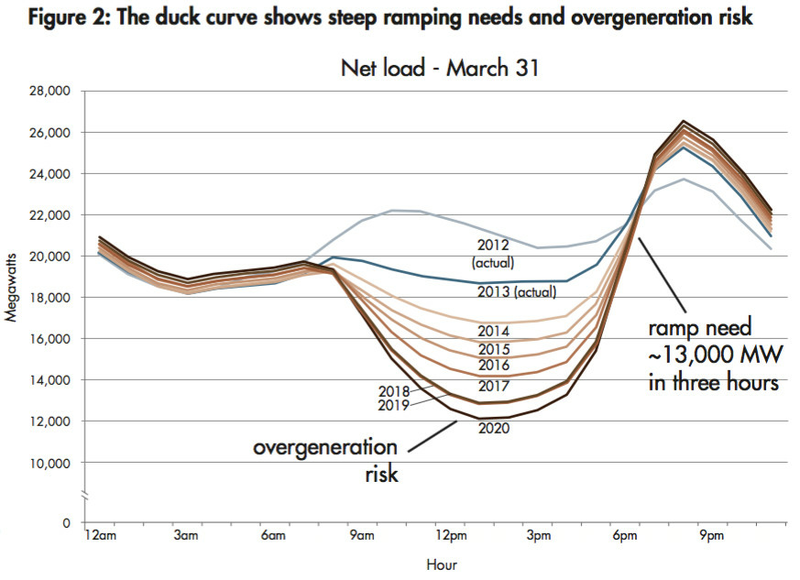 Perhaps the biggest obstacle to distributed power is who pays for the grid. Traditionally the power producers did. When a significant portion of power is made on-site, that trashes that economic model. Plus, when in history did the big established powers just roll over and concede wealth generation. Just like to point out this was published I think in 2014, since then the wind turbines have improved even more. Mega projects take up land, but they're remarkably cheap to purchase, install, maintain, and remove. Commercial rooftop works because utilities charge commercial customers by peak demand; shaving that peak demand saves a disproportionate amount of money. There are places where roof installations are perfect, such as large commercial buildings with flat roofs and peak loads coinciding with peak sunlight. E.g. a Wal Mart Supercenter located in the US Southwest, with its heavy A/C and refrigeration loads. Tesla's Gigafactory in Nevada is another great example. 1) Sales, design, installation, & financing are more expensive - sometimes to the point where the cost of the panels is irrelevant. 2) They're not aesthetic. We can dismiss that all we want, but aesthetics matter in living spaces. 3) Roofs are rarely perfectly angled for sunlight, reducing total production. 4) Homeowners may not want to take on the risk of expensive equipment breaking. 5) Maintenance & cleaning of residential rooftop systems is difficult. Another thing homeowners won't want to deal with. Hence, residential rooftop solar hasn't taken off as expected. This is a great example of how the free market sees all. If it isn't happening voluntarily, there's almost always a good reason. As a side note, renewables are incredibly capital intensive. I wonder what rising interest rates will do to their payback period. Out of curiosity, how was that 65% figure arrived at? onshore wind farms of any size take up very little space relative to their output because they can be farmed close up to the turbine towers. Solar farms on land in hot dry climates can actually improve agricultural output by providing shade. As for residential solar I agree in some part that commercial installations have economy of scale. Residential solar it may not have taken off in the USA but its been massive in Europe and Australia. Finally the answer I was looking for when I started the thread before about home installation and why I should/should not do it. Thank you. Now I can sleep easy in my air conditioned bedroom that is ultimately powered by....not sure what it's powered by. Might be coal. Might be garbage. @Tom Kirkman do you know what my host government uses? In any case, I don't need to stay awake another night knowing I'm the only one in the world that's not doing my part with solar on my roof.